ARB-L18-3500U is a high capacity 18650 Li-ion rechargeable battery with a built-in micro-USB charging port. It also includes a protection circuit in the anode to help prevent short circuits, over charge/discharge and over heating. This battery can quickly be charged without the need for a separate charger. This not only save you money from purchasing a charger, but also convenience of not having to carry around another device. 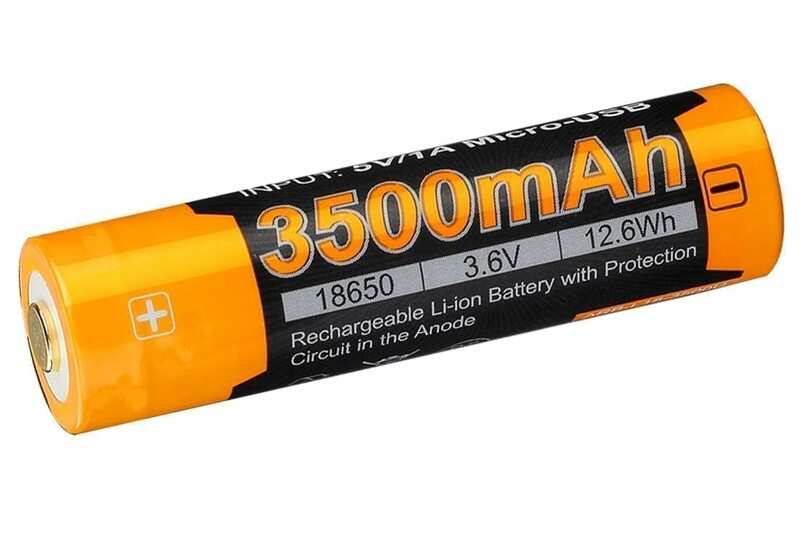 This will work in all of the current models that utilize a li-ion 18650 battery, including best sellers like the PD35 V2.0, PD35TAC, TK20R, TK75, TK15UE, and more. The batteries are very long lasting. I just purchased the latest charger and it’s handy to use because of the visual information it gives you during charging. This is a great rechargeable battery. I wish I would have bought batteries like this years ago! So Far . . . . only charged once – it took plenty of mA to fully charge upon receipt – so it’s clearly near the stated mAh capacity. In service now! I like the added mini-usb chargeability – adds portability, though I’ll usually use my own charger. Nice battery which I both two. One as a backup. Like that you can charge it using a micro usb cable, outside of the flashlight. Good strong battery. I love how the usb plugs right into it. Good battery lasts a long time between charges. Awesome battery. 2 ways to charge. I charged it once with mini usb had it in my torch for over a month and still has a full charge. Will be getting a few more of these. I appreciate the light indicator on the top of the recharger battery, but I wish the indicator would flash or blink when close to full charge instead of the solid red light when plugged in. I.e less than fifty 1 blink a second, seventy five percent charge 2 blinks… etc. I know I’m asking for a smarter battery which would be hard to program and install in such a small device, but I wouldn’t mind spending the extra money for a simple feature like that. It is a great light. I would highly recommended this. Battery works great with l the light. I like the ability to charge it via a typical cell phone USB charger. Awesome. Needs to be $10.00 or less on price. I can’t believe you can recharge the batteries individually. I recently purchased 6 PD35 flashlights and love them. this battery is a breeze to use and is powerful. I will be getting more. I feel a good light is important and I have found one that I would like every one I care about to have. No real experience with this battery yet. Good charge, although I’ll probably use the charger stand for faster times. Battery works as needed. Don’t like micro USB. Would like USB C connector. Great battery life. Love the led indicator when charging! Charged easily and seems to really hold a charge. I thought It would have come with charging cord. The battery supplied steady power through the operating life of a full charge. Quality battery that does the job. This battery holds a charge very well, and charges fast. Purchased as a replacement and could not be happier. The built in USB charger allows me multiple charging options. I am not tied to an outlet anymore! I use my light quite a bit and this battery holds the charge. Like the built in charging port. Sorry to hear that – I will have someone from our warranty department contact you. This very convenient unit was a big improvement over the previous model. Incredible flashlight. Extremely bright and nice to have the different levels of brightness. I probably should have opted for both instead of one, to have the rechargeable feature but i’ll just use the rechargeable one to charge both batteries. It’s amazing for such a small flashlight to have the power it has. Never realized I could be so impressed with a battery. This thing is solid. A month later I haven’t had to recharge.. Carry it every day. Battery lasts long per charge, super convenient, way better than continuously buying non rechargeable batteries. I have charged these batteries without a problem but, honestly, I’m still using the 2600mAh that I’ve been using for a few years now so I really cannot review this battery yet. I use my Fenix UC35 on the lower brightness settings maybe 80% of the time, so the batteries LAST quite a while. I do expect the 3500mAh to last a ridiculously long time. Outstanding battery! Well worth the price. Seems very solid and I feel is a safe battery. Holds its charge. Seem to work very well – noidea yet on longevity . . .
High performance, and long lasting. Delivers plenty of power and holds its charge when not in use. These batteries are awesome. Charging them with a USB cable makes them very convenient. I have 2 sets of these batteries now and have been using one set for more than a year in 2 different Fenix PD35TAC flashlights. The PD35TAC and these batteries are my everyday carry for work. I can say with 100% confidence, that if you purchased a Fenix PD35TAC and these Fenix batteries, you will be very happy with their reliability and performance. Lasts a long time. Charges at a decent rate. Time will tell if the charging port is durable. So far I have no complaint. My husband needed rechargeable batteries, so i purchased this to try and it is working great for him. He uses his torchlight daily for work. I bought 1 battery for me and 2 batteries for him, so he always has a fully charged backup, and all is going well, so do hope it stays that way. love the built in charging capabilities. Easy to charge last super long. I love the USB charging port on these batteries. I also own 4 PD 35 Tactical lights, and 2 HL60R Headlights equipped with these batteries. Fenix is by far the best lights I’ve ever used. Thanks. Great battery, holds a long charge and recharging is fast. Very high quality, reliable products that do what they advertise. Thanks Fenix! A long lasting easy to charge battery for a reasonable price. Works great, love the optional charging port. Very convenient to charge and use in place of store bought lithium batteries, and less expensive overall! A great investment for your flashlight. Easy to charge and lasts as expected. Time will tell if I get the full number of charges but so far so good. Convenient to plug in directly. Easy to use and to charge. Holds a long charge. I use it everyday! Happy with the battery life so far. Can’t speak on how long the battery itself will last as I have only charged it about 3 times. This Batt. will give you a little bit more run time than the one that comes with the light .When your running low just remove the 2900 mah batt. and put this one in and let there be more light . Sturdy battery. Love the charging port built into the battery itself. You won’t have to pack a separate charger. The battery also has a light that tells you when it’s charging and when it’s charged. What more can you ask for? Love the ability to recharge. This battery has worked great for me so far! We went on vacation and I’m the only one who carries a flashlight, so it saw a *lot* of use over the week and a half we were in the mountains. I’ve been using it in the PD35, at all levels of brightness, and it hasn’t needed recharged yet. Great capacity and great convenience, 3500 mAH and an USB charging port are the perfect combination. These are great batteries. The run times in both the HP25R and HL60R are outstanding. Having the ability to recharge outside of the lamps allows me to top off multiple batteries at one time without a dedicated charger. The only issue I have had with these is one burned out when I accidentally plugged it into my cell phones quick charger. These batteries are pretty long, but will also work with some of the Zebra lights as well. Seems to hold charge well. These batteries are very high quality and last for quite a while. Despite their high capacity, they charge much faster than expected. The many battery protection features are also a plus. These batteries can’t be beat by any other brand, period! I have bought many different brands to try and get by without spending the money, but don’t even try the others out, they can’t compare. Strong, reliable and with options. Great battery. Excellent battery to keep your Headlamp and flashlights bright! Holds a long charge. Easy to recharge. I keep,a couple lights in our emergency bags, so was looking for the longest run times. The 3500U is just what I needed. love the USB port right in the battery! I can charge it at home, work or in the car. Thank you for a great product and the accessories to support it! Charging the battery is a breeze with the built in charging port. Great battery with long life and easy charging! Cost effective and reusable. Everyone who can should switch to the environmental friendliness of rechargeable power. Love the durability and the ease of charging them. I love the ability to charge this battery with only a usb cable directly to the battery. Battery is ok. Fenix could have provided the usb charging cable. Great product, got 2 for back-up. Very satisfied. This battery works very well – easy to charge and it has a long life. My preference is the 3500 size instead of ones with less capacity. The “U” here seems to stand for the ability to charge the battery directly without a charger. Seems to charge faster with the charger. Great product. Great little battery. Outstanding job! These batteries are truly great. The usb port makes charging them very easy, as everyone has a charger or three. They exhibit a very long run time. I have been using them for a while now and have had no problems. Hi Al, our customer service has not received any emails from you. Please email customerservice@fenixlighting.com or call the number on our home page and ask for Blake. Thank you! Haven’t baught one yet, but I’m glad they went to a 3500 mAh capacity, also like that it has a fully charged light. Looks like a great battery.